This d’Arenberg Ironstone Pressings 1997 was tasted directly after the ’97 Rosenblum Zin Sauret and oddly, it made a fitting transition, but we’ll get to the specific tasting notes in a minute. d’Arenberg is a 4th generation family wine company helmed by the unique Chester Osborn whose bottled produce is as unusual and worthy of sincere investigation as the man himself. d’Arenberg is a relatively large producer for the artisan level quality and is just as ready to sell you a ubiquitous $10-15 blend (Stump Jump, d’Arry’s Original), or a moderately priced single-vineyard offering (The Derelict), as a rare and powerful (and pricey) bottle made from 100+ year old decrepit vines, who have already lost a limb to age (The Dead Arm). While I have never met the man, never profited from the sale of any of his labels, I am an avid consumer of it, and it would be dishonest to not admit my bias. Look for the tall, skinny label that reminds you of a diver’s flag and there’s a pretty good chance, there’s some nice juice under it. I’m listening to an awesome pile of records, which is four obsolete recorded music formats ago, for those of you under 30. I don’t know why it took me so long to set up the turntable and phono stage, particularly with the Krell CD player refusing to open its door, and yes, I tried asking nicely. I had apparently forgotten the frustration of those records that never sounded like they should have. Some albums were recorded digitally and were simply transferred to the analog format for its own sake rather than being specifically re-mastered for the process, which is why the Flaming Lips’ wonderful Yoshimi Battles the Pink Robots sounds completely flat on its super cool translucent red vinyl. And I pre-ordered two consecutive Andrew Bird albums, Mysterious Production of Eggs and Armchair Apocrypha, both of which showed up literally stuck to the sleeve, as if put away wet, and have never once played clean. And then one settles into a sincerely crafted masterpiece, such as Radiohead’s Kid A (on double 10”) which just ended or the 200gram virgin vinyl re-mastered pressing of Hendrix’ Axis Bold as Love, whose controlled chaotic left-handed genius current courses through my auditory system. Now one quickly recalls that every advancement in audio (before digital compression) was a failed attempt to sound as warm and as real as a record. Because we’re all bold as love, just ask the axis. He knows everything. 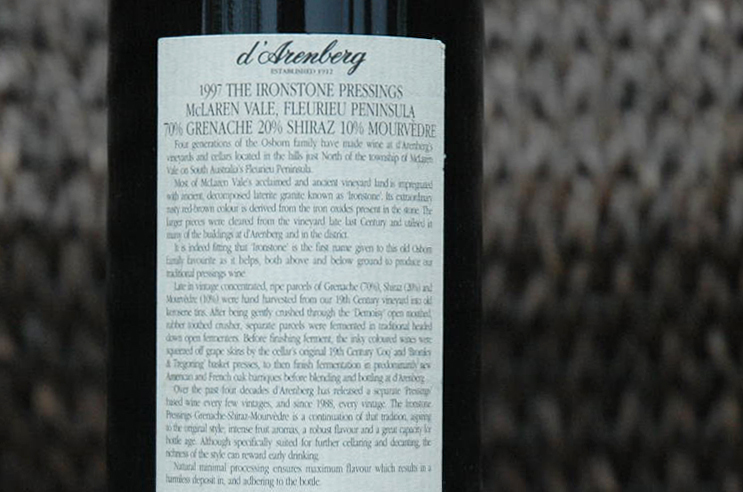 The d’Arenberg Ironstone Pressings 1997, even at this age, is brooding in the glass and immediately shows copious black and spiced red fruit, cavernous depth, awesome length, and the (al)most unbearable concentration of being. Please forgive the hyperbolic alliteration, but I did warn you that I’m listening to Jimi on vinyl, and this wine really is a stunning blend of typical Australian varietals (Grenache, Shiraz, Mourvedre), pushed to a-typical greatness. 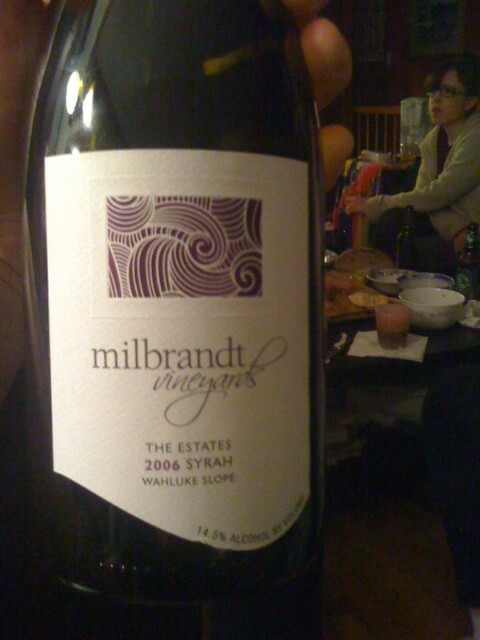 It drinks like a burly, brambly, dry-but endlessly lush, version of the previously tasted and much evolved Zin. 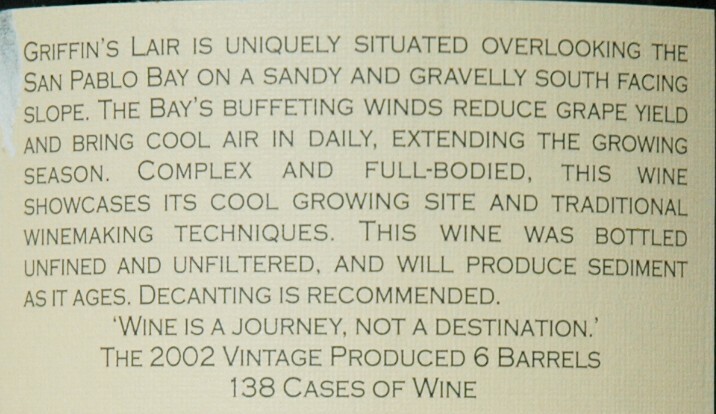 The ’97 Ironstone Pressings is showing an unusual nose, currently dominated by red cherry, menthol, and volcanic ash. The massive fruit on the palate, after some breath, seems poured over crushed granite with hints of smoked game. Its texture is luscious and rich with an up front (non-syrupy) sweetness and a deep palate-shaking dryness before the long finish. This is a wine that I’ve followed for some time, and unlike the ’98 (which matured much more rapidly), this ’97 d’Arenberg Ironstone Pressings has finally and fully come into it’s own. I look forward to future consideration of the ’97, while getting back into my stash of ’01s and ‘02s, of that same skinny label. 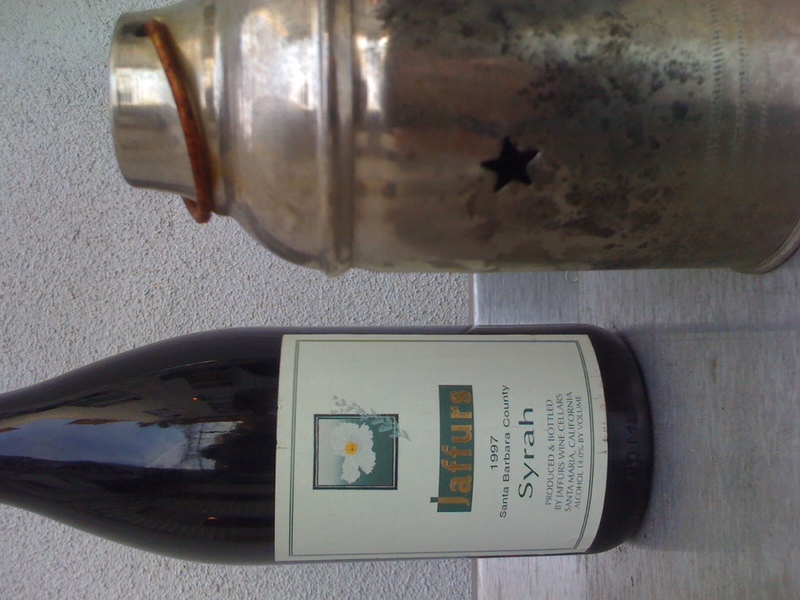 After the unexpectedly weighty ’86 Beringer Cab Private Reserve, over world class steak, whose name shall not be spoken, the follow-up (or the closer, if you’re into baseball metaphors) was a Pax Syrah Griffin’s Lair 2002. 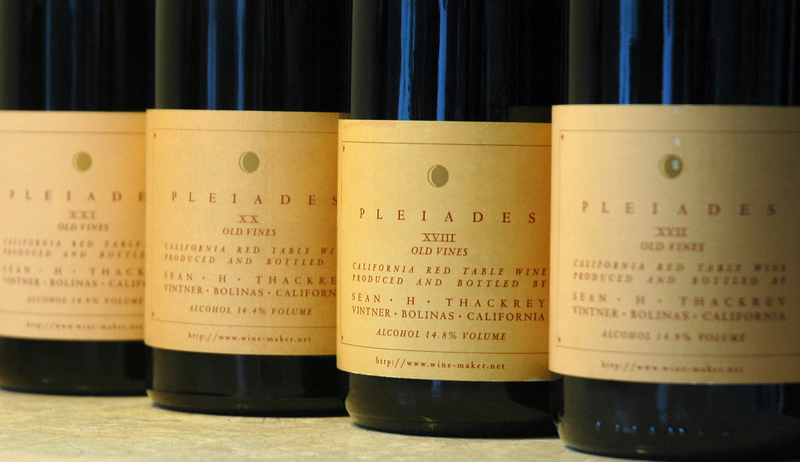 As those familiar will know, wine is no longer bottled under the Pax label and the new wines from that former partnership now sell under the Donelan Family Wines label, while Pax Mahle, the winemaking partner, currently produces Wind Gap Wines as well as the remarkably concentrated and complex Agharta wines. 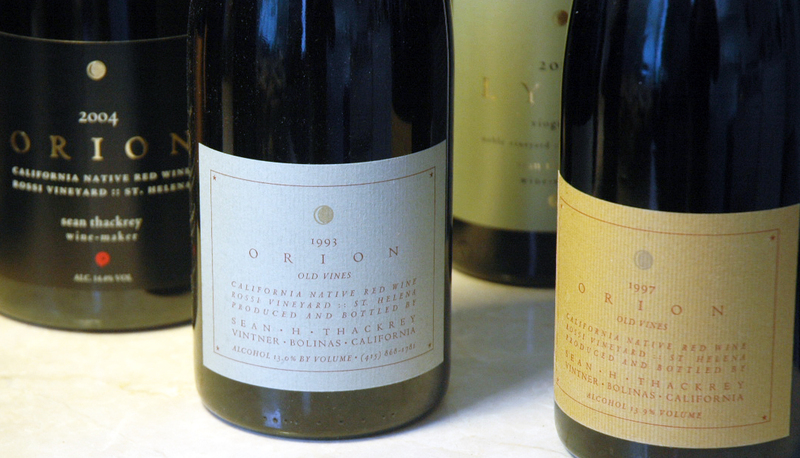 All legal discord aside, all involved continue to produce and release compelling syrah-based wine. I have not tasted a wine in which Pax was involved that wasn’t a worthy experience and, full disclosure, I remain on the Agharta mailing list. A quick glance at the few Twitter accounts that Mahle bothers to follow, seems to indicate that he’s down with the hippie music. And since I co-edited Relix Magazine’s tribute to Phish (with Jesse Jarnow), shortly after their disbanding, and penned its lead feature, on the Tom Marshall/Trey Anastasio songwriting team, let’s talk about them. This will likely get me banned from PhantasyTour (is that still a thing? ), but it’s not okay to pretend that Phish is the band that they were prior to their post-hiatus disbanding. The millennium show was a profound, albeit drug addled, high water mark ; it was the thing that all of those crescendos were building toward. The silence that followed was deafening. The members of Phish are all unquestionably skilled musicians, but they once wielded the power of the sustained crescendo, unlike almost any other, creating a glorious cacophony affectionately known as Phish Noise, to the nerdiest* of the flock. The best of Phish’ current jams sound a lot more like rehearsed segues, or parts of recycled ones, than the maintained mathematical chaos that once ebbed and flowed between songs. And most of the songwriting since the re-banding is, lyrically and sonically, retread at best. 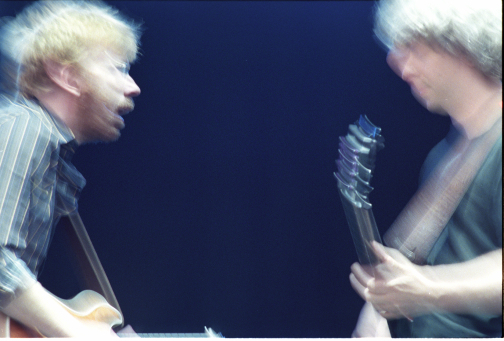 To anyone who insists that Phish is as good today as they were up to the millennium, do a couple of shows dead sober, for a change, and tell me what you hear. The 3 most interesting projects, made by any members of Phish, since 2000’s Farmhouse and The Siket Disc: Mike Gordon & Leo Kottke’s Clone, Mike Gordon’s Inside In, and Joey Arkenstat’s awesome and absurd concept album Bane, “produced” by Mike Gordon. 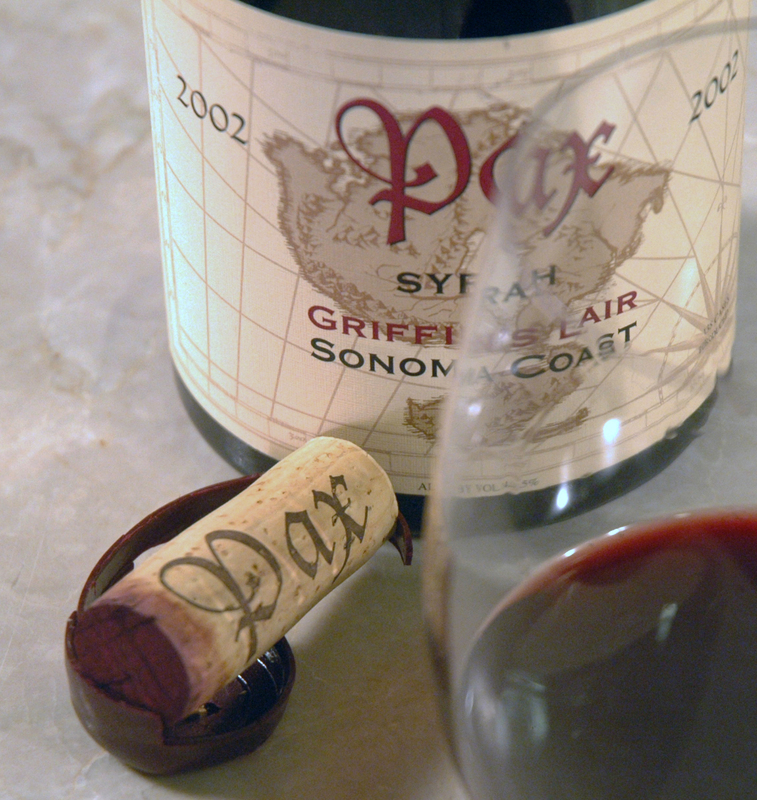 The Pax Syrah Griffin’s Lair 2002 is deep, opaque purple in the glass, fading to concentrated ruby, at the very rim. There is significant sediment, adding to the depth of the color, and forcing me to curtail my swirling habit. There’s a massive attack of concentrated black and red fruit on the palate, but the lushness of the mouthfeel puts kid gloves on that aggression. After some breathing time, red currant becomes a dominant presence and there’s something just a touch green, hiding in the depths, under layers of smoke and wood, pine tar, and white pepper. The nose is largely of blackberry brandy and glycerine, though with further air, some of the fruit and complexities of the palate become apparent to the olfactory. After a long finish, there’s a slight aftertaste of dry roasted nuts. 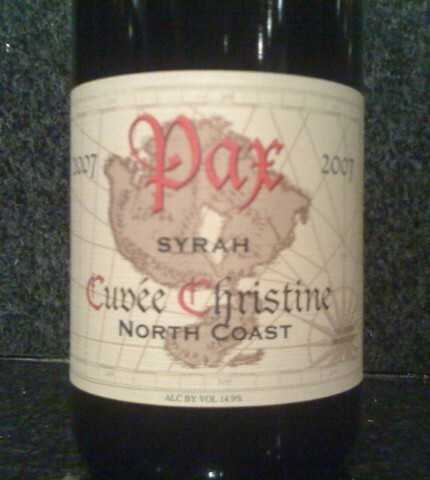 The Pax Syrah Griffin’s Lair 2002 is fresh(er than expected) and bold and ripe, but much to my surprise, it’s still showing hot enough to singe the hair, but not the flesh, leading me to believe that this wine has at least a handful of good years left in it. Perhaps its best is yet to come. *Here in Brooklyn, the term ‘nerd’ is a complement. Nerds make all the good stuff. I enjoy both Whitcraft as a winemaker and Stolpman Vineyards for their fine syrah. I am more familiar with Witcraft for their pinot noir and recently, a nearly decade old Whitcraft Pinot Noir sourced from Bien Nacido Vineyard showed quite favorably, at my table. So, when Whitcraft Syrah Stolpman Vineyard 2007 came up on the boutique flash discount site Lot18, at the lowest available price in the country, I grabbed enough to qualify for free shipping. 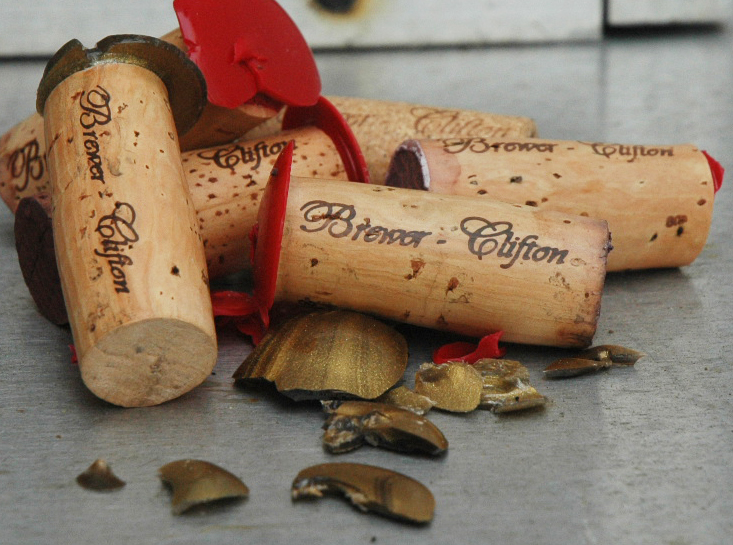 Speaking of which, Whitcraft Pinot Noir Bien Nacido 2007 is up on Lot18.com right now, expires soon. Nice wine and a great label font. I’m listening to Rana’s “Carbombed Again” from their Here in the USA album. Members of Rana are involved in multiple other bands and projects now, though they do occasionally still play together here in the NYC. About a decade ago, they were actively writing effective songs, rocking hard every time out, and packing a small circuit of local clubs. During the stripped down rock resurgence of that time which birthed the White Stripes and the Strokes, Rana seemed poised to get as big as they desired/deserved. Their best stuff like “Carbombed” and “Backstage Pass” sounded undeniably anthemic in their moment(s) and, as of today’s listening, they stand the brutal test of time, like champions. Having sampled an assortment of Stolpman syrah as expressed by the winemakers at Ojai, Arcadian, and at Stolpman Vineyards, I know that they grow world class grapes. This Whitcraft Syrah Stolpman 2007 is yet another worthy expression of said lovely fruit. It’s deep, dark, almost opaque red, heading toward black. Is Vamp still a color? The experience opens with a nose of smoked meat and morning fog. The palate is predominantly dry black raspberry and the mouthfeel is lush; it’s dense and brambly, but not biting. This is big, high alcohol (14.9%) syrah, that manages to stop short of brooding. 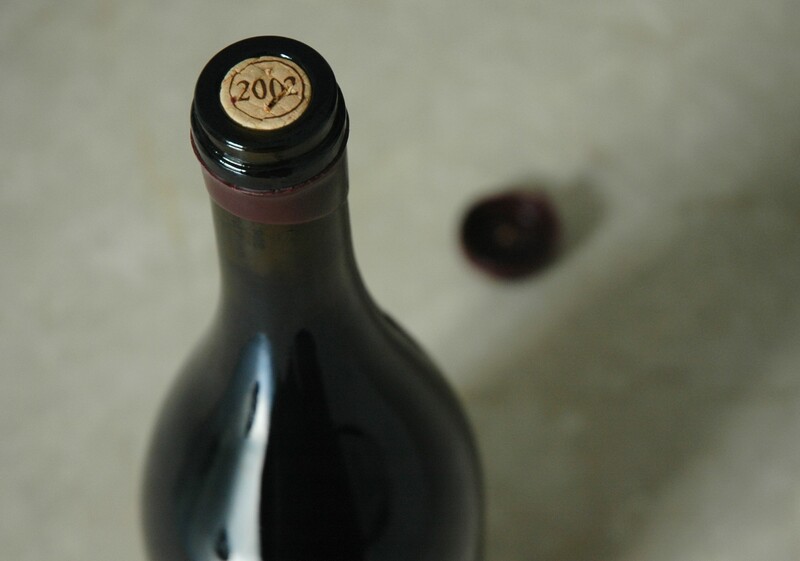 It’s surprisingly integrated for a wine of it’s youth and build, but much of the palate is yet to evolve and it will most certainly benefit from another few years in the cellar, and will likely drink quite well for another decade.